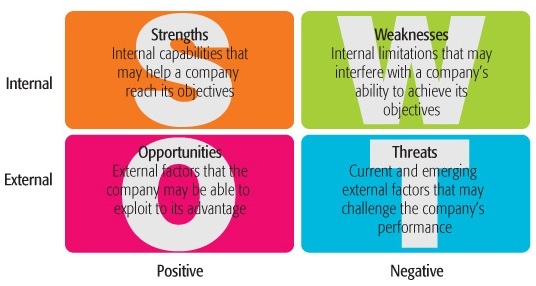 SWOT analysis is a tool used to help identify opportunities and weaknesses. SWOT analysis is a very widely used method for analysing regional context during RIS3 process. The mapping exercise showed that 87% of the selected regions used SWOT analysis in determining regional assets and region’s relative positioning. It is important to ensure that the results of SWOT analysis are shared amongst all members of the quadruple helix (academia, business, public administrations, and civil society) to achieve a common understanding of regional strengths, weaknesses, opportunities and threats among all RIS3 stakeholders. SWOT analysis identifies strengths, weaknesses, opportunities, and threats. Strengths and weaknesses can be considered internal factors. The strength section answers questions such as: “What advantages does the region have?” and “Where does the region perform best?” The weakness section answers questions such as “What should the region avoid?” or “What obstacles are there for innovation-based economic growth?” These sections analyse the intrinsic assets of a region, such as the areas in which the region performs well and the areas in which it falls short against the global competition. In contrast, the opportunities and threats sections are designed to consider external factors. The opportunities section is used to identify areas where a region could expand its activities based on its strengths. This section answers questions such as: “What are the relevant global trends?”, “What advantages could new technologies and innovations developed in the region offer?”, and “What options do regional strengths open up?”. In contrast, threats identify areas that may negatively affect the region. This section answers questions such as: “What obstacles to innovation-based economic growth does the region face?”, “What is the global competition?”, and “What threats do regional weaknesses expose the region to?” These sections analyse how well a region could expand in new directions, or develop further in existing areas based on the strength and weaknesses of the company. This method is helpful as a basis for the analysis of a regional/national context in order to identify key areas which need to be appraised in greater detail through other methods. The goal is to assist in achieving a holistic assessment of the impact of the mix of helpful and adverse influences affecting the potential of a region to achieve structural transformation of its economy. SWOT essentially enables RIS3 stakeholders to evaluate at glance the prospects of smart specialisation and determine how well it can build on the regions strengths and advantages, as well as growth in leading areas of research and innovation. SWOT analysis is simple to implement and can be easily distributed amongst stakeholders. Once completed it would be possible for the relevant stakeholders to cross-reference other SWOT analyses done in their region. This could help to identify strengths or weaknesses that they had not yet considered, enabling stakeholders to work together and share the outlook by identifying areas of opportunity for all of them. 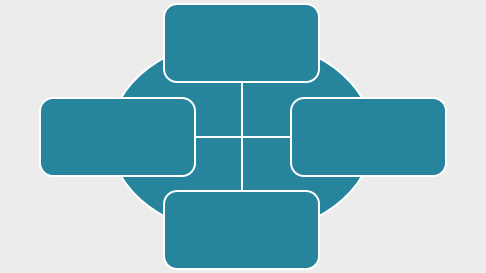 A SWOT analysis is a useful basic method in the RIS3 design process. This methodology could make it easier for regions to identify areas of opportunities for research and innovation based economic growth. Improved design processed and the communication of SWOT analysis results can improve understanding among regional stakeholders the areas that need to be explored. The benefit of this method is its simplicity and further usability of the results in more advanced analysis of specific specialisation areas. This method will require research into generic strengths, weaknesses, opportunities, and threats that regions or countries experience with regards to structural transformation of the economy. The SWOT analysis process can be used to encourage regions to consider aspects that they may not previously considered. Furthermore, some prompts may be required to help regions interpret the results of their SWOT analysis. It is crucial that the stakeholders understand differences between strength and opportunities, as well as weakness and threats. For this reason, clear instructions are required outlining and detailing the purpose of each section of SWOT analysis and how it can be useful. Furthermore, a structured template may be needed to aid stakeholders in completing their SWOT analysis, which should be coupled with the aforementioned prompts. Furthermore, the above links also include SWOT analysis worksheets that can be used to aid in completing each section of analysis. Identify a good template for SWOT analysis and effective prompts for each section of the analysis. Some form of decision support may be useful for this section. For example, a form of survey in which the stakeholder fills in the blanks and then is able to view a rough analysis of their results to better help them draw conclusions from what they have inputted. Decide on or develop a method by which stakeholders can share and discuss the results of their SWOT analysis. This is possibly achievable through the exploitation of SciCafe 2.0 Platform integrating the Citizens’ Say Knowledge Exchange tool (SciCafe2-0.eu) as a simple ‘discussion table’ or via a modified version of a World Café online.